The Archdiocese of Indianapolis is a Christ-centered Catholic community that upholds the dignity of every human person touched by crime in order to practice mercy, and foster hope and peace. 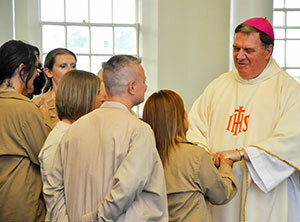 The mission of corrections ministry in the Archdiocese of Indianapolis is to create an environment of trust through a lens of Catholic social teaching by witnessing the Gospel to the incarcerated, formerly incarcerated and victims/families, through healing and mentoring processes. The Archdiocese is committed to actively engaging parishes and parishioners to educate and advocate for policies that help reduce violence and provide for the pastoral needs of all affected by crime. November 3, 2018: Corrections Ministry Conference: "My Heart Near to Your Heart"
The Corrections Ministry of the Archdiocese of Indianpolis is hosting a conference: "My Heart Near to Your Heart" at St. Paul's Catholic Center, (1413 East 17th Street, Bloomington, IN 47408-1602 from 8:30 am - 3:30 pm. Who should attend? Clergy, lay volunteers, those in corrections professions, and anyone interested in learning more about Corrections Ministry. Parish teams especially encouraged to attend. The day will begin with opening comments from Archbishop Thompson, followed by Liturgy of the Hours. Father David Link, lawyer, dean of the Notre Dame Law School, husband, father, grandfather, widower, and now Catholic priest, Father Dave Link’s story is an inspiration and challenge to all. 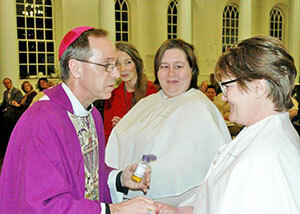 In his priesthood, Father Dave does more than visit the incarcerated; he truly transforms their lives. His inspirational book,“Camerado, I Give you My Hand”shares his story and how God can be found anywhere and will be available for purchase. The day will include interactive concurrent breakout sessions, networking with successful programs and ministries across the Archdiocese, and the opportunity to hear directly from those in re-entry and their families.